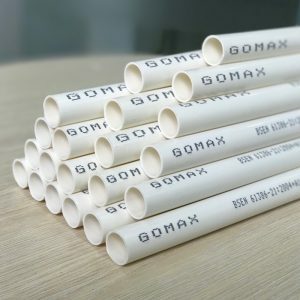 GoMax Joint Stock Company is a plastic manufacturer which main products are plastic pipes used to protect electric cables and telecommunication cables. Our goal is that becomes a top manufacturer of Corrugated HDPE Duct, PVC Conduit Pipes, plastic fittings and accessories for the electrical, telecommunication and building industries in Vietnam and SouthEast Asian. 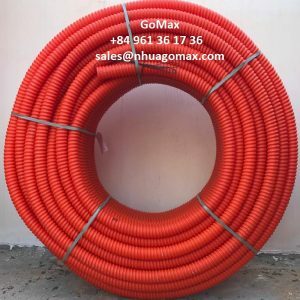 Produced from plastic beads, HDPE will contribute to “underground” systems of electric cable, telecommunication cable, street lights, garden, golf, resort, high voltage up to 220KV, etc … With many advantages such as continuous length, easy bending, great bearing capacity, economical and labor saving, Corrugated HDPE Duct is replacing the other common tubes and is widely used in underground cable installations. Manufactured from high quality PVC, insulation capacity, fire protection and great pressure resistance, PVC conduit pipes is used to construct buildings, apartments, villas, resorts, etc. HDPE, PVC pipe fittings and other plastic specifications. Products of Gomax Joint Stock Company response the requirements of quality standards of Vietnam, Europe, and the strict requirements of customers. With good quality and competitive price, we hope that we will have opportunities to help you realize your idea. GOMAX is always your best choice. Providing contruction supervision by engineers. Warranty period of Corrugated Pipe & Rigid Conduid Gomax is 01 years from date of purchasing. Address: 8th Floor, 289 Dinh Bo Linh street, Ward 26, Binh Thanh District, Ho Chi Minh city, Vietnam. Monday – Friday: 08:00 am – 05:00 pm.